The new 150 and 200 mm Q3X models solve challenging part-detection applications with small contrast differences. 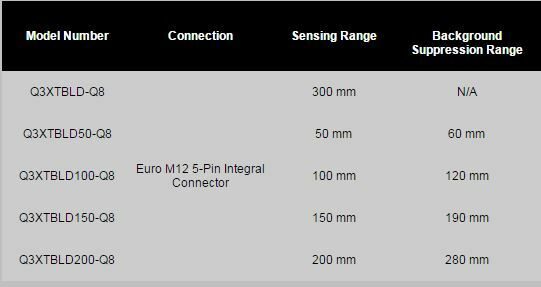 Q3X sensors are easy to set up and their metal housing withstand harsh environments. These sensors can also be programmed for low contrast detection within the teachable sensing range while ignoring objects in the background. Due to its rugged metal housing, three-digit display for easy to read feedback, and versatility in solving challenging part-detection applications, the Q3X expands the types of applications Banner can solve.